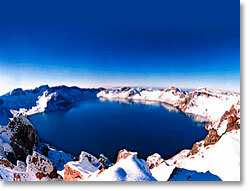 See you in Changchun, China, next August 21, 2005, at the ICO-20 Congress!! 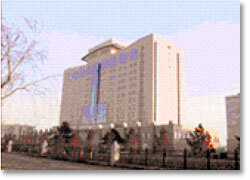 The twentieth Congress of ICO will meet in Changchun, China, August 21-26, 2005. This traditional congress in optics started fifty seven years ago. Indeed, the first official meeting of ICO took place in Delft, Netherlands, 12-17 July 1948, at the Physics Laboratory of the Delft Technische Hogeschool. Actually, forty-four delegates from eleven countries attended the meeting. The ICO Congress consists of a scientific meeting and of the business part, known as the ICO General Assembly. The scientific meeting is expected to be the largest ICO event ever with more than 1,000 participants from all over the world and will, as usual, cover all areas of optics and photonics and related interdisciplinary topics and industrial applications, providing an outstanding opportunity to review progress and challenges of our discipline. The congress is sponsored by the Chinese Optical Society and the Changchun Institute of Optics, Fine Mechanics and Physics (CIOMP). CIOPM is a multidisciplinary base institute mainly engaged in fundamental research, applied fundamental research and engineering technology research and high-technologies. Nowadays it develops rapidly toward acknowledgement and high-technology innovation. 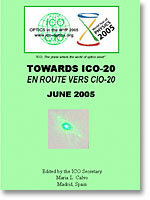 ICO-20 is co-sponsored by the Chinese Academy of Science, the Chinese Academy of Engineering, the Chinese Association of Science and Technology, the National Natural Science Foundation of China, IEEE/LEOS Asian office, EOS, OSA, Optical Society of Korea, Optical Society of Japan, Optical Society of Russia (the Siberian Branch), OWLS and SPIE. A major exhibition on local, national, Asian and international optical industries is expected to give a unique opportunity for the quite exciting atmosphere and knowledge of the current optical industries market in this region. A spectacular view of the Changbaishan Mountain ("Ever White" from the Chinese language) located at the Jinlin province, China. The city of Changchun, located Northern-East Beijing (somehow 1,000 Km away), in the Chinese province of Jinlin (part of the old Manchuria) is a dynamic, modern and industrial Chinese city. As an example, it has the largest automotive industry in China. Delegates from all ICO Territorial Committees will meet twice during ICO-20 and review ICO activities and policies, admit new members and elect the new Bureau that will hold office for the next triennium 2006-2008. At every ICO General Meeting, the General Assembly elects the President, Secretary, Associate Secretary, Treasurer and Vice-Presidents for a three-year term. The chairperson of the Nominating Committee, Professor Arthur Guenther, ICO Past-President, has written to the Territorial Committees and requested nominations and endorsements for all positions. Of course, representation on the ICO Bureau is open to all Members and it is hoped that a fair geographical distribution, as well as a good balance with regard to professional activity will be reached. The election procedure is detailed in the ICO Statutes and in the ICO Rules and Codes of Practice, both of which can be found on the web site, or can be obtained from the ICO Secretariat. Every year, at the occasion of the Winter College, held in February, at the International Center for Theoretical Physics (ICTP), Trieste (Italy), the ceremony of the ICO/ICTP Prize takes place. For the year 2005 the ICO/ICTP Prize has been awarded to Dr. Sarun Sumriddetchkajorn a researcher from the National Science and Technology Development Agency (NSTDA), Pathumthani, Thailand's Ministry of Science and Technology. Dr. Sumriddetchkajorn was born in 1973. In 2000 he presented his PhD dissertation at College of Optics and Photonics, CREOL (Florida, USA) under the supervision of Nabeel Riza. His main subject of research was multiwavelength fiber-optic switch array retro reflective structures, under both theoretical and experimental studies to analyze optical crosstalk level. Back to Pathumthani (Thailand) he pursued his work and organizes activities, both scientific and professional, to promote optics and photonics in his country. He is currently a full-time scientist at the Thai National Electronics and Computer Technology Center (NECTEC) in which he develops both academic and research activities. 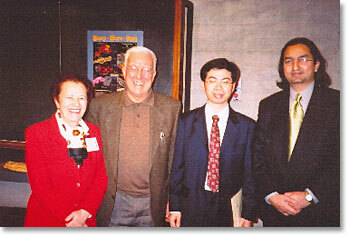 In 2004 Dr. Sumriddetchkajorn was the recipient of Thailand's 2004 Young Scientist Award. The ceremony of this award, held in August 2004, had the presence of some members of the Thailand's Royal Family. The ICO/ICTP Prize Committee has considered the outstanding merits of Dr. Sumriddetchkajorn, as a young researcher from a developing country and achieving mainly his scientific contributions in his country of origin. The citation reads: "For his achievements in applying Photonics and Micromechanics to Biomedical Devices and Telecommunications. His commitment in diffusing the interest for Optics and Photonics in Thailand deserves a special mention". Moldova, associate in 2004, is now represented by Prof. Andrei Andries. He is the Director of the Center of Optoelectronics at the Institute of Applied Physics, Academy of Sciences of Moldova, at the capital city Chisinau. Ecuador, associate in 2005, is now represented by Nikolai Espinosa. He is a PhD research scientist and teacher at the Scientific Research Center of the Army Polytechnic School, located at the capital city Quito. These two new associate members are having a great meaning in what it has to be the covering of activities in optics and photonics all over the world and to strength mutual cooperation. It is greatly expected that they will be admitted as full members at the occasion of the forthcoming ICO General Assembly to be held in Changchun, China, next August (22-25, 2005). Once again, our most sincere welcome to these two communities. India was the location of the International Topical Conference in Applied Photonics "Superresolution and Photonics". India: It has developed various activities during the WYP2005. 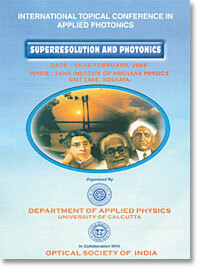 Among them we can mention the International Topical Conference in Applied Photonics "Superrresolution and Photonics", held 15-16 February 2005 at the Saha Institute of Nuclear Physics, Salt Lake, Kolkata (West Bengal). The meeting was organized by the Department of Applied Physics, University of Calcutta and in collaboration with the Optical Society of India (OSI). This meeting had the support of ICO. The General Chair, Prof. L.N. Hazra, General Secretary of OSI, was organizing this topical conference with an important presence and contributions from Indian scientists and colleagues all over the world. Nine plenary talks, twelve invited talks and twenty nine communications performed quite an interesting forum on a sounded topic that is now having relevance at the Indian scientific community. The Technical Digest contains the scope of all the contributions. At its first page one can read the reproduction of a contribution written by C. V. Raman in 1930 on Science and Calcutta, one can quotes: "...Science derives her strongest impulses from the desire to serve human needs as well as from the purely philosophic desire to understand nature more deeply". This is the spirit that is maintained these days no doubt. Ireland: The new President of the Irish Territorial Committee is John McInerney. He is professor and Head of the Department of Physics, University College Cork, at the National University of Ireland. Japan: The new President of the Japanese Territorial Committee is Koichi Iwata. He is a professor at the College of Engineering of the Osaka Prefecture University. Sweden: The new President of the Swedish Territorial Committee is Fredrik Laurell. He is a professor at the Royal Institute of Technology (KTH) where he develops his research activities at the Laser Physics Group, Dept. of Laser Physics and Quantum Optics, AlbaNova University Center. The new Secretary of the Swedish ICO Committee is Ulf Olin. He is PhD Chief Technical Officer at CernoluX AB. Enhanced contacts are provided as well by Klaus Biederman, as a liaison between the ICO Committee and the Swedish Academy of Sciences. He is a professor at the Royal Institute of Technology, Department of Biomedical and X-Ray Physics, Visual Optics Group, AlbaNova University Center and a former Vice-President of ICO Bureau (Terms: 1981-1984 and 1984-1987). Any corrections on the current information or news of ICO Territorial Committees have to be reported to ICO Secretariat: icosec@fis.ucm.es. 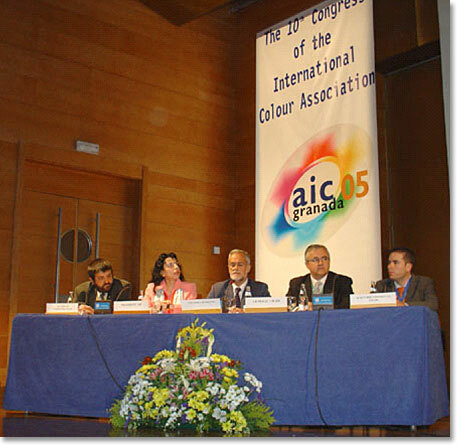 The 10th congress of the International Color Association: AIC Colour 05, was held in Granada (Spain) last May 2005. Opening Ceremony of AIC Colour 05, Granada (Spain). From left to right: J. Pujol: President of the Color Committee of the Spanish Optical Society, AIC President P.J. Alessi, M. Díaz: Vicerrector of the University of Granada, J. Romero: Chair of the congress, J. L. Nieves: Programme co-chair. The 10th congress of the International Color Association: AIC Colour 05, was held in Granada (Spain) last May 2005. The congress belongs to a series of meetings organized by AIC every four years. The congress was also hosted by the Spanish Optical Society and included the 7th International Symposium on Multispectral Colour Science (MCS'05). AIC is an International organization formed currently by twenty four countries and twelve observers. ICO has sponsored this congress with the main aim to support and dedicate efforts toward areas in science, that are having common interests with optics and moreover that are relevant because its connections with industry and education. The ICO financial assistance was addressed to grants for young researchers of developing countries attending the conference. The interdisciplinary nature of the conference was noticed by the subjects covered in a total of 36 parallel sessions (12 of them qualified as Symposia) dealing with wide-ranging, including such varied topics as color-appearance models, color management, color imaging, the multispectral processing of chromatic information, the colorimetry applied to industries dedicated , for example, to food processing and analysis, materials such as textiles and ceramics, color-representation systems and color-difference formulas, color in education, color vision, color physics, color in interior design, color within the urban environment, color in object design, color restoration, the use of color as an element of artist expression and color in different popular cultures. The variety of topics produced a high interest and interaction among the more than four hundred participants. ICO was represented by the Secretary General, Maria L. Calvo who had a great occasion for exchanging ideas with colleagues and current AIC representatives. It is quite comprehensive that we congratulate from these pages to Javier Romero (General Chair) and all the colleagues from the Department of Optics of the Faculty of Sciences in Granada University for their great work. The publications of the two volumes proceedings will serve as well to the dissemination of the updated contents in this active area. The policy for supplying exceeding of proceedings to educational centers from developing countries has been also applied generously, as well, by the local organizers. The unique atmosphere created by the Granada city was a punctual circumstance to be added to the great success of the congress. ICO-20, Triennial Congress of the International Commission for Optics "Challenging Optics in Science and Technology"
7th Int'l Young Scientists Conference "Optics and High Technology Material Science SPO 2006"
Responsibility for the correctness of the information on this page rests with ICO, the International Commission for Optics; www.ico-optics.org.